This article will be short and sweet. We on the Express Account Management team wanted to make sure that our customers knew how to run bandwidth reports to monitor their Brightcove account’s monthly bandwidth. Since all the Express plans are on a month to month basis, it is important to check your account’s bandwidth periodically throughout each month. At the very least, you should set a reminder to check your account towards the end of each month. The bandwidth reporting is in a separate section from the Analytics Module. To access, log into your Brightcove account and click on the ‘Reports’ link in the top, right section of the Homepage. Once in the reporting section, leave the left column selection on ‘Summary’ and choose ‘Month to Date’ from the range drop down to see your bandwidth report for the current month (you can choose any date range you desire here so you can generate reports for previous months as well). Then click the ‘Go’ button to generate the report. 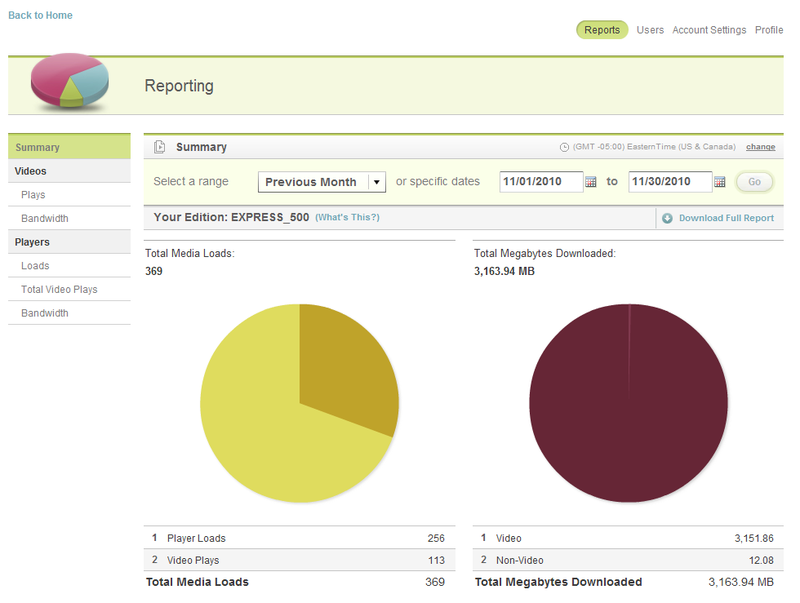 On the right, the total megabytes downloaded is shown which is your account’s total bandwidth used. Remember, your bandwidth is shown in MBs so divide by 1000 to convert to GBs. That’s it. There are also other interesting ways to break out your bandwidth data by selecting different categories on the left menu. For example, you can look at bandwidth from a per video perspective seeing which of your videos consumes the most bandwidth. You can also look at things from a per player perspective. Here you can examine which of your video players consumes the most bandwidth. This would be particularly interesting if you have players syndicated or shared on other web properties. While the Analytics Module is the primary source for video analytics and understanding your audience, it is also important to understand the Reports section. The Reports section will give you important billing information about your account and help you understand where all those GBs are coming from!